The North Warner Landscape covers 410,000 acres where private landowners and agencies are working across ownership boundaries to promote forest health and fire resiliency. Within this larger landscape, the North Warner Multi-Ownership Forest Health Project (Project) encompasses approximately 150,000 acres and focuses on dry forest restoration. This Project is unique due to the extensive stands of old legacy ponderosa pine intermixed with aspen and meadows, with greater sage grouse focal habitat immediately adjacent to the north and east. The landscape is at a severe risk of uncharacteristically intense disturbance due to heavy fuel loading and stand densities. North Warner Property Ownership Map (click to enlarge) - The Project is located within four watersheds: Crooked Creek, Honey Creek, Deep Creek, and Thomas Creek and contains 51,525 acres of National Forest System (NFS) lands, 32,100 acres of non-industrial private forest land, 17,865 acres of industrial private forest land, 47,220 acres of private land, and 1,290 acres of Bureau of Land Management (BLM) land. Managing landscapes from ridgetop to ridgetop is a successful strategy to improve overall watershed function. Everything that occus in the uplands affects water release, capture, and storage throughout the landscape. This type of management benefits timer stands, habitat for fish and wildlife, and working landscapes. Restoration and management improvement projects have occurred across private and public lands in the Crooked Creek Watershed. 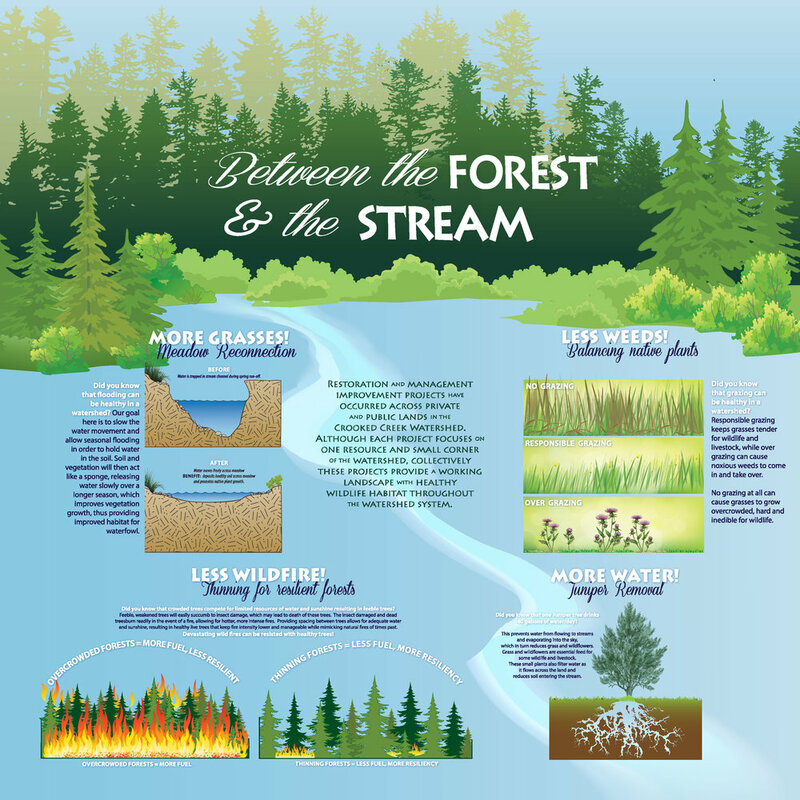 Although each project focuses on one resource and small corner of the watershed, collectively these projects provide a working landscape with healthy wildlife habitat throughout the watershed system. In 2015, with initial funding from the Oregon Department of Fish and Wildlife Mule Deer Initiative, partners began an outreach and education effort that included multiple meetings, workshops, and tours. The purpose was to engage landowners in the inventory and planning process that would facilitate eventual cross-boundary implementation of forest health practices. 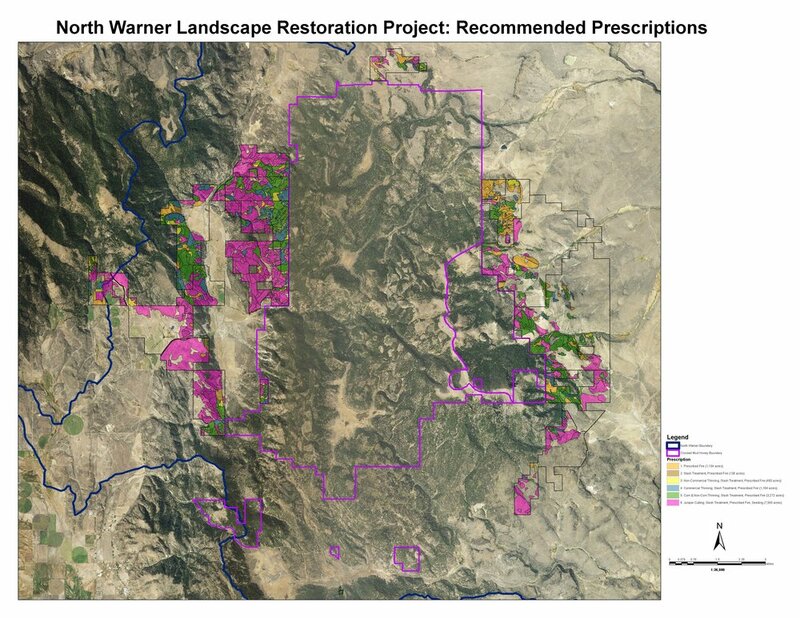 To date 20 landowners have become engaged in the North Warner project, allowing for resource inventories and treatment planning on more than 30,000 acres. KLFHP Partners Amy Markus (USFS) and Daniel Leavell (OSU KBREC) discuss the North Warner project on a forestry tour May 2017; image courtesy of NRCS Oregon. Extensive GIS analysis and field inventories of forest resources on private lands in 2016 allowed project partners to develop stand by stand treatment prescriptions. These maps, prescriptions, and additional resources were provided to landowners as the foundation of individual forest management plans. Treatment prescriptions for participating private lands (click to enlarge). Concurrent with mapping and treatment planning, partners pursued implementation funding through numerous federal, state, and private sources. 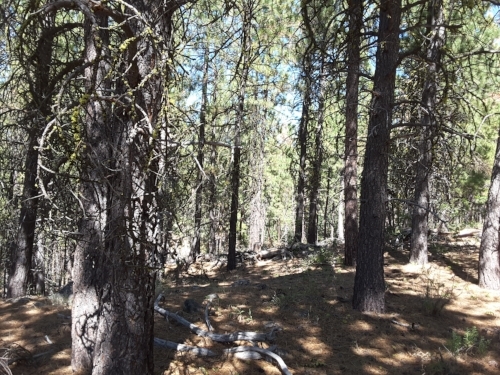 Funding for this project is focused on forest health treatments in dry ponderosa pine/mixed conifer forests and aspen stands through commercial harvest, small tree thinning, and slash treatments (i.e., piling, lop and scatter, pile burning, and/or prescribed fire) on federal and private lands. As of fall 2018, forest health thinning has been conducted on 5,082 acres of private land and 21,351 acres of National Forest (see map below). The second phase of projects (2019-2021) will engage ten new private landowners with a goal of thinning another 5,000 acres, and the National Forest is planning to treat another 12,800 acres.